The Symmetrical Triangle can be characterized as an area of indecision. Also known as a coil, it usually forms during a trend as a continuation stock pattern. And just as a wound up coiled spring holds enough tension to propel a toy, a coiling action in a stock can propel stock prices. In the stock market, the tension builds on the increasing uncertainties of buyers and sellers. 2 trend lines are required to form a symmetrical-triangle. Therefore, a minimum of 4 points are required to begin considering a formation as a symmetrical-triangle. The second high should be lower than the first and the upper line should slope down. The second low should be higher than the first and the lower line should slope up. Ideally, the pattern will form with 6 points (3 on each side) before a breakout occurs. Prior Trend: In order to qualify as a continuation pattern, an established trend should exist. The trend should be at least a few months old and the symmetrical triangle marks a consolidation period before continuing after the breakout. Volume: As the symmetrical triangle extends and the trading range contracts, volume should start to diminish. This refers to the tightening consolidation before the breakout. Duration: The symmetrical triangle can extend for a few weeks or many months. If the pattern is less than 3 weeks, it is usually considered a pennant. Typically, the time duration is about 3 months. Breakout Time Length: The ideal breakout point occurs 1/2 to 3/4 of the way through the pattern's development or time-span. The time-span of the pattern can be measured from the apex (convergence of upper and lower lines) back to the beginning of the lower trend line (base). A break before the 1/2 way point might be premature and a break beyond 3/4 usually means loss of potency without meaningful price advances. Breakout Direction: Even though a continuation pattern is supposed to breakout in the direction of the long-term trend, this is not always the case. Do not assume or jump the gun. 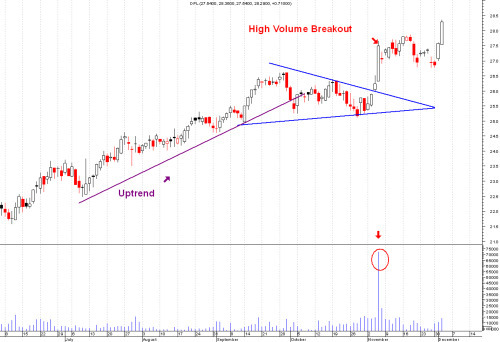 Price Breakout The breakout should occur with an expansion in volume, especially on upside breakouts. Use an indicator such as On Balance Volume to confirm. Price Target: There are two methods to estimate the extent of the move after the breakout. First, the widest distance of the symmetrical triangle can be measured and applied to the breakout point. Second, a trend line can be drawn parallel to the pattern's trend line that slopes (up or down) in the direction of the break. The extension of this line will mark a potential breakout target. When looking for patterns, it is important to keep in mind that technical analysis is more art and less science. If you are looking for the perfect pattern, it may be a long time coming. Return from "Symmetrical-Triangle" to the Home Page: "Stock Market For Beginners"